Sherpa's description of the Saba-Tek pants is as follows: "According to Buddhist records, Sakyamuni, the founder of Buddhism, entered nirvana under the Saba tree. No matter what the season, you can go in search of your own nirvana in these state-of-the-art, stretchy, technical, abrasion-resistant pants. Articulated knees, 4-way stretch fabric and a gusseted crotch combine to give you the ultimate in mobility and comfort. Ankle zips allow easy on/off over boots." The Saba-Tek pants are weather resistant soft shell pants. They are part of Sherpa Adventure Gear's lifestyle collection. According to Sherpa's website, they "make great travel partners, whether you're half a world away on the trip of a lifetime, or half a day's drive from home. Light, versatile, sturdy, and wrinkle-resistant, they take up minimal space in your pack, are handily presentable when unexpected authorities ask to see your passport or fishing license, and do the job of keeping you fresh, dry and comfortable over multiple days of hard use." The Saba-Tek pants arrived with a cardboard hangtag that listed their features and Sherpa's lifetime warranty against defects in material and workmanship. As noted on the hangtag, the pants are water resistant, breathable, quick drying and abrasion resistant with a 4-way stretch fabric that is durable and versatile. They have low profile belt loops, articulated knees, instep patches for added durability and zippered ankle openings. The pants are solid black with just a few small embellishments. In particular, Sherpa's name is in white lettering just above the left thigh pocket and their logo is on the right back pocket. The pants sport six pockets in total. There are two zippered front hand pockets with dimensions of 6" x 12" (15cm x 30cm), two zippered thigh pockets with dimensions of 5" x 6" (12cm x 15cm) and button flap closures, and finally two zippered rear pockets with dimensions of 8" x 6" (20cm x 15cm). All six pocket zippers have short pull cords to make it easier to open and close them while wearing gloves. 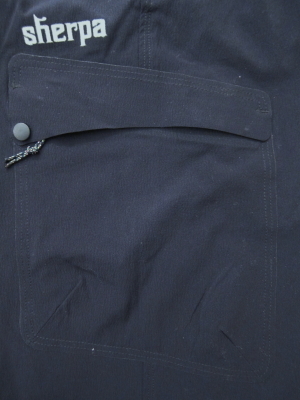 The two front hand pockets and two rear pockets are lined with fleece on the inside. The four upper pockets are large enough for my hands to fit in easily while the two thigh pockets are large enough for energy bars, a cell phone, and other items. 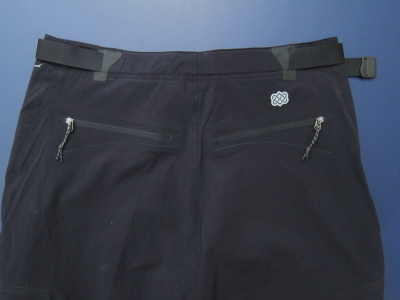 The pants are secured with a 1" wide (2.5 cm) black nylon belt and black plastic buckle. The buckle has an imprint of Sherpa's logo that is barely visible in matching black. 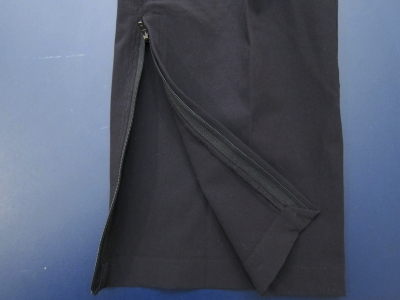 The pants open with a metal snap, metal loop and a 5.5" (14 cm) long zippered fly. When lying flat, the pant measure about 8.5 in (21.6 cm) wide at the cuffs and the leg zippers are 10" (25 cm) long to allow fitting over hiking shoes. Inside the rear waistband of the pants are three tags. The first tag says Made in Nepal and has the pants' waist measurements, in my case 32" (81 cm). The second tag simply has the company's name on the front and their slogan on the back. The final tag lists the fabric construction: 96% Nylon, 4% Spandex and provides the care instructions on the back: "Machine wash luke warm; Do Not use bleach or fabric softeners; Line Dry; Use low iron and for dry cleaning, any solvent except trichloroethylene. At first glance, the Sherpa Adventure Gear Saba-Tek pants are pretty impressive. They are great looking and I was immediately impressed with their styling. The fabric is soft with a tight weave that should hold up well to abrasion. The pants are lightweight and stretchy similar to other soft shell clothing I have inspected, however they are relatively thin which leads me to believe I'll be wearing thermals underneath them this winter. The pants appear well constructed and of high quality. They have no loose seams or dangling threads and all of the zippers operate smoothly. The zipper pulls are a nice touch that should come in handy when I'm wearing gloves. Another neat feature of these pants is their smooth waist band which should protect my waist from any irritation from pack straps while backpacking. Regarding sizing, the Saba-Tek pants are described on Sherpa's website as being relaxed fit and they come in even waist sizes only. I have a 31" (81 cm) waist and so I was concerned about ordering the next larger size as I thought they might be too baggy and loose fitting. Luckily this was not the case. Upon trying on the pants, I was surprised to find that they have a slim, athletic fit and just fit me. In fact they seem almost tailor made. Unfortunately Sherpa does not offer the pants in different inseams. These pants have a 32 inch (84 cm) inseam, while my inseam is shorter. They still fit very well though and the leg openings are not so large that they fall down over my shoes or bunch up excessively around the shins. These pants are very comfortable. They have a slight stretch to them and move very freely in all directions. With their snap closure and nylon belt, the pants stay securely in place. The interior fabric is comfortable on bare skin, although it seems to cling just a bit to my polyester base layer. The pockets are nicely placed and they are deep enough to store snacks, small equipment or cold hands. The Saba-Tek pants have a comfortable fit and appear to be well constructed with quality materials, tight stitching and sturdy seams. I really like the styling of these pants and the six zippered pockets which are all quite large. The nylon fabric is soft but not too thick and so I anticipate I will need to add a layer underneath them. Hopefully they will be warm enough and stand up to the rugged conditions often encountered while winter backpacking. Over the next few months I will put these pants to the test and ultimately decide whether they earn a top spot in my winter arsenal. This concludes my Initial Report for the Saba-Tek Pants. I will post a Field Report in approximately two months. Please check back then for further information. I would like to thank Sherpa Outdoor Adventure and BackpackGearTest.org for providing me with the opportunity to test these pants. During the past two months I have worn the Sherpa Saba-Tek pants on three backpacking trips for a total of eight days. In addition, I have worn them on two day hikes as well as around our neighborhood. I have encountered a few warm days with weather in the mid 50's F (13 C) but typically I have been backpacking in temperatures ranging from the mid 20's F (-4 C) to upper 30's (3 C). Night time temperatures have dropped into the low 20's F (-5 C) on a few occasions but have mainly been above freezing. Since conditions have been mild and wet, mud has been a nearly constant factor. The terrain has varied from very hilly trails to flat paths and creek beds. 1. My first trip was an over-night excursion to the Charles Deem Wilderness in the Hoosier National Forest just outside of Bloomington, IN. I stayed mainly on established trails during this 9.8 mile (15.8 km) hike due to muddy conditions although I ventured off-trail to explore around my campsite in the evening. Temperatures ranged from 39 F to 50 F (4 to 10 C) and skies were overcast. 2. My second trip was to Devil's River in Manitowoc, Wisconsin. This rail trail was 14.2 miles (22 km) long as it wound through farmlands, prairies and wetlands. Along the route were two railroad trestles which crossed the Devil's River and its tributaries. Temperatures were in the upper 20's to low 30's F (-2 to 3 C) during this outing with snow on the ground. 3. My final trip was to Brown County State Park. Daytime temperatures during this three day backpacking trip ranged from 28 F (-2 C) to 34 F (-7 C), with nighttime temperatures around 22 F (-5 C). The weather was cloudy with light winds and intermittent showers. The terrain was hilly and trails were slippery and quite muddy. I hiked 12 mi (19 km) over the course of this trip. Elevations ranged from 530 ft (161 m) to 720 ft (219 m). The Sherpa Saba-Tek pants have performed wonderfully during my past two months of Field Testing. They fit well and provide excellent wind resistance and breathability. In addition, they are warmer and more durable than my old soft shell pants. As compared to hard shell pants, the Saba Tek's are not waterproof, but they dry quickly and are much lighter in weight. Below are details regarding my field experiences with these pants. FIT: As mentioned in my Initial Report, the Saba-Tek pants have a trim, athletic fit. Overall, they are quite comfortable but they do not provide me much wiggle room. Despite their slim fit, they have not limited my range of motion as the fabric stretches in all directions. I have not experienced any pulling or binding in the crotch, hip or thigh areas of the pants when scrambling over rocks or downed trees as the fabric slides easily across my skin. The interior feels soft and doesn't chafe even after a long day of backpacking. The pant legs are a little long as my inseam is 30 inches (76 cm) and the pants are only available in 32 inch (81 cm) length. To remedy this, I simply roll the pant legs up and they work fine. The belt is comfortable and stays in place once adjusted to the appropriate length. I have had no problems wearing a heavy pack over these pants. FUNCTIONALITY: The Saba-Tek's have a lot of pockets, and I've used all of them at one time or another. They are well sized and easy to get things into and out of. I really like the fact that all of the pockets have zippers so that my knife, wallet and other essentials don't accidently fall out. The front pockets are large enough for my knife and a compass or map. They've also come in handy for stashing items such as trail mix and treats for my dog. The fact that they have a fleece interior makes them a great place to put my hands on cold days. I found the rear pocket useful for carrying my wool gloves or a folded map. 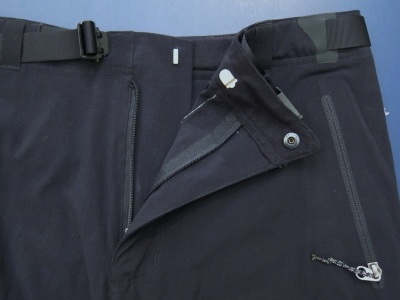 The thigh pockets are large enough for items like a knit cap, LED flashlight or GPS. The zipper pulls on all of the pockets and the pant cuffs are easy to hold onto while wearing gloves. Unfortunately the zippers on the pant cuffs do not open far enough for me to slip the pants on or off while wearing hiking boots. BREATHABILITY: One of the great features of these pants is that the fabric dries very quickly and does a great job of wicking moisture away from my skin. They seem to dry quicker than my other pants when subjected to snow or wet brush and I have never noticed them becoming wet from sweat. On a recent trip the pants got soaked while hiking through wet brush but they were mostly dry by the time I got back to camp. WATER RESISTANCE: The Saba-Tek pants have repelled water quite well so far. They are not waterproof like hard shell rain pants, but water does bead up on their surface and roll off easily. They obviously have a water repellant finish although I have not found this information advertised anywhere on Sherpa Adventure Gear's website. When subjected to constant rain or when kneeling in snow the pants eventually wet through, but as mentioned above they dry very quickly. Despite being washed several times, they still repel water as well as when I received them. Typically water repellant finishes only last a few cycles through the wash before they stop beading water so I am curious to see how long this finish lasts. 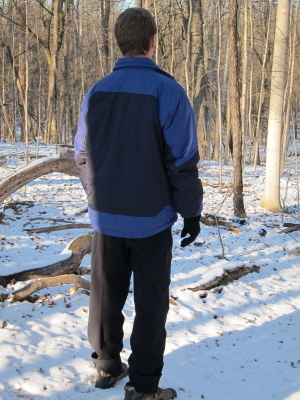 WARMTH: Although the Saba-Tek pants are not insulated, they provide great wind protection. They have also retained enough of my body heat while hiking that I have only needed to add tights on a few occasions. In all fairness the weather this winter has been very mild so far and I have yet to wear these pants in single digit temperatures. 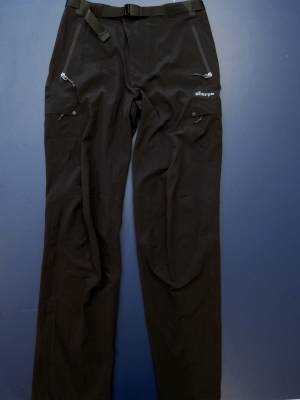 Most of my trips had temperatures around 25 F (-4 C) to 38 F (3 C) for which the Saba-Tek pants were quite adequate. Before heading up to Wisconsin in late December, I wondered if they would keep me warm on the trail or if I should pack a second pair of pants just in case. As I concluded on the return trip, the Saba-Tek pants were more than adequate for the conditions. In general I like to wear tights under shell pants in hiking temperatures below 35 F (1.6 C) but these pants have proven so far to defy odds. I fully expect temperatures to drop over the next few months and so I will hold off on declaring these 4 season pants till my Long Term Report. DURABILITY: The Saba-Tek pants have held up remarkably well so far. They are in great shape and have suffered no damage or significant wear from scrambling over logs or through brush. The pants have some slight abrasion on the seat and knees but that is to be expected. The zippers, belt buckle and front snap all continue to operate smoothly. Any dirt and grime from the trail came off in the wash and left no staining. So far there is no fading or discoloration. So far, I really like the Saba-Tek pants. They are lightweight, comfortable and quick drying. They have kept me warm in cold weather and have proven, so far, to be durable. I also like the fact that they have plenty of pockets for small essentials and trail snacks. I am looking forward to continued testing with these pants. This concludes my Field Report. Please check back in about two months for more test results. Thanks to Sherpa Adventure Gear and BackpackGearTest.org for allowing me to test the Saba-Tek pants. During the past two months I wore the Sherpa Saba-Tek pants on two more backpacking trips for a total of four nights. I also wore them on several day hikes through local parks and around town on weekends. Unfortunately my hope that temperatures would drop in February and March, so I could test the lower limits of these pants, didn't happen. Not only did we have an unseasonably mild winter but spring, or should I say summer, came early. The past two weeks have seen lows in the upper 50's F (14 C) and highs topping 80 F (26 C). Good thing I got my last two backpacking trips in before the heat wave as it is now 'shorts' weather. 1. My first trip was to Mound State Park in Indiana. Daytime temperatures during this two day backpacking trip ranged from 44 F (6 C) to 56 F (13 C), with nighttime temperatures around 34 F (1 C). The weather was cloudy with light winds and intermittent showers. The terrain was hilly and trails were muddy. I hiked 11 miles (17 km) over the course of this trip. Elevations ranged from 550 ft (168 m) to 730 ft (223 m). 2. My second trip was near the town of Oldenburg in southeastern Indiana. During this two day outing I mainly hiked off-trail through woods and farmland several miles outside of town. I covered 9.5 miles (15.28 km) across moderately hilly terrain while temperatures ranged from 39 F to 50 F (4 to 10 C). 3. I also wore these pants on several day hikes at local parks in Central Indiana including Cool Creek Park, Koteewi Park and McGregor Park. The distances I covered varied from 4.5 miles (7.2 km) to 13.1 miles (12 km). Weather conditions during these trips were generally pleasant with mild winds and sunny skies. After wearing these pants for over four months, I continue to be very pleased with their performance, comfort and durability. Although the weather did not cooperate this winter and I wasn't able to test the low end temperature limit of these pants, I remain confident in their ability to keep me warm in temperatures down to the mid 20's F (-3 C). On several occasions when cold winds had me convinced I would become chilled, the Saba-Tek pants simply blocked the wind and prevented it from reaching my body. They also did an excellent job of retaining my body warmth on cold days. On the other extreme, they have worked quite well in temperatures approaching 70 F (21 C) as long as I wasn't too active. I have spent the last two weekends day hiking in local parks and found these pants to be quite comfortable in early morning hours before temperatures reached 65 F (18 C). In warmer weather I found that I would sweat when hiking aggressively, but the pants dried very quickly once I stopped and did not retain any odors. In this regard they provide great versatility as they can be worn in a wide range of temperatures without becoming uncomfortable. The pants continue to fit very well and I have had no problems with them binding or restricting my motion in any way. Despite their slim fit, they stretch as needed and I have easily been able to step over downed trees or scramble up steep slopes with no trouble. I also really like the 'no bulk' waistband and thin belt which has allowed me to carry my backpack for hours at a time with no discomfort whatsoever. Sherpa has really done a wonderful job with these pants. The only thing I would suggest is that they add additional inseam lengths for those of us who are shorter or taller than average and don't wear 32" (81 cm) inseams. Although I had some initial concerns about the durability of these pants for backpacking pursuits, I have not had any tears or frayed seams in the fabric. There are some wear marks on the lower legs and seat area but I was certainly expecting this given the abuse they have been subjected to. In addition, the pants have held up well through several washings and have no permanent stains or fading. Kudos to Sherpa for designing high quality, feature rich pants that look great and perform even better. I have really enjoyed wearing these pants during the past four months. They provided excellent warmth in most winter conditions despite their lightweight design. They were comfortable to wear as well as wind proof, durable and fast drying. My only wish is that they were available with a shorter inseam. Sherpa Adventure Gear has done a great job designing soft shell pants with so many features that they will make me think twice before reaching for hard shells. This concludes this test series. I would like to thank Sherpa Adventure Gear and BackpackGearTest.org for the opportunity to test these pants.